It seems like this has become such a hackneyed combination of late – in the past year it seemed like every restaurant we’ve visited has had a beet/goat cheese salad on their menu. But you know what? That’s because the flavors are PERFECT together. Oddly enough, though, I don’t think I had ever combined them at home. We eat beets fairly frequently, since I discovered the glory of roasting them in olive oil until they get soft and caramelized, but we usually just eat them straight and blazingly hot, or mix them with other roasted vegetables. I also once made a beet salad from the Zuni Cafe Cookbook where they were marinated in black currant vinegar and mixed gently with walnuts and watercress, but somehow beet salad never made it into the regular home repertoire. 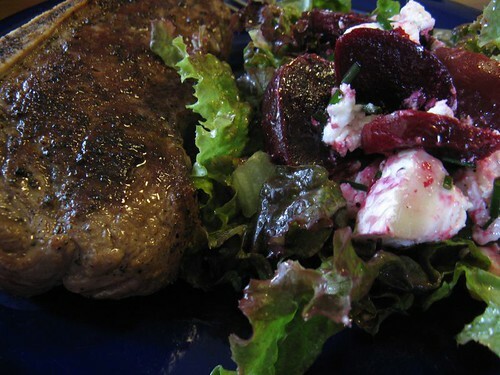 A few days ago, though, I was shopping for something to go with a steak from our freezer, and I noticed bunches of baby beets from one of the local farms. 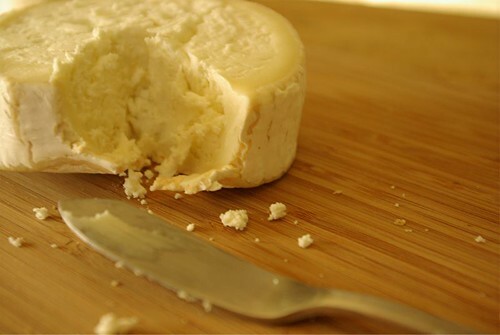 As I was picking out a bunch, I suddenly remembered the half-round of Bucherondin chevre lurking in our fridge – we had eaten some of it along with good bread and the shrimp gratin earlier in the week, but then run out of bread – and it’s much too good of a cheese to allow to spoil. So I picked up a head of redleaf lettuce as well, hauled my goodies up the hill and plopped the beets into a pan of water to simmer. Once they were fork-tender, I ran cold water over them and slipped the skins off, cut up the beets into thick slices and drizzled a little walnut oil over them. The chevre I cut into small chunks, which went into the bowl with the beets. Then I tossed the lettuce with a dressing of olive oil, Dijon mustard and red wine vinegar, and took it all to the table so we could compose our own salads. It was a thing of beauty alongside the steak, with an Oregon Bordeaux-style wine (Cana’s Feast Bricco Two Rivers – delicious) and a good pan sauce. Why don’t I do this more often?